Hawaii Native Status: Cultivated. 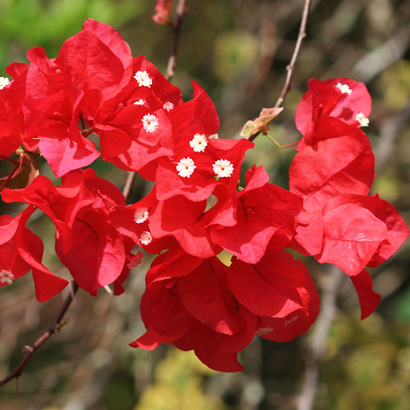 These ornamental garden plants are native to Brazil. 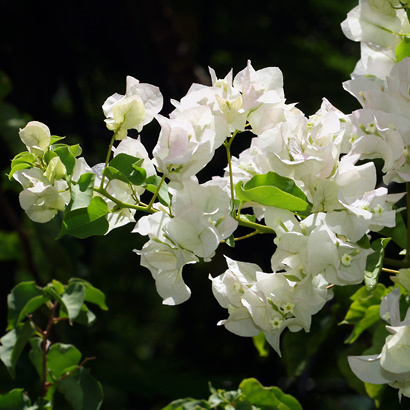 Flower Color: White to tinged yellowish or greenish. 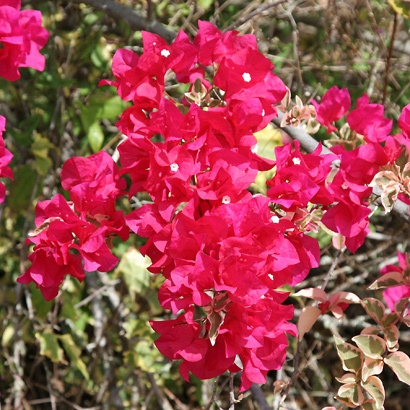 The far more conspicuous floral bracts are pink, red, orange, yellow, purple, or white. 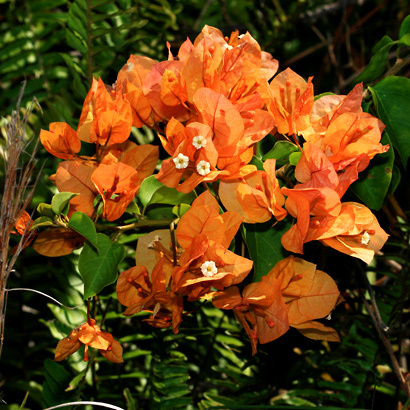 Description: The small, tubular, whitish, 5 to 6-lobed flowers are surrounded by 3 colorful, papery, triangular to egg-shaped, petal-like floral bracts. 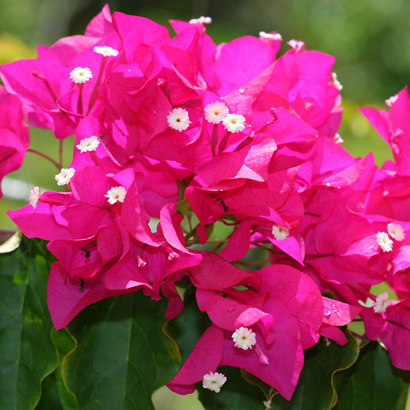 The leaves are green or variegated with yellow, cream, or pale pink, alternate, and egg-shaped, elliptic, or heart-shaped. The mature branches are woody, brittle, and have slender spines at the leaf axils. The plants are climbing or straggling. 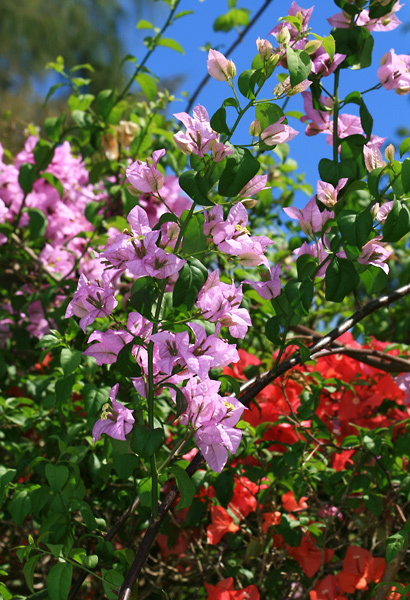 Two very similar cultivated Bougainvillea species are grown here in Hawaii, along with a variety of hybrids like Bougainvillea × buttiana. 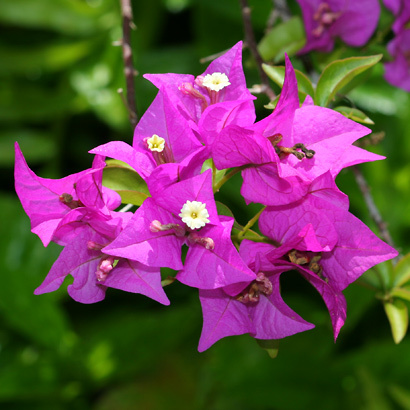 Paperflower (Bougainvillea glabra) has distinctly 5-angled (pentagonal) floral tubes and shorter, acute floral bracts, while Great Bougainvillea (Bougainvillea spectabilis) has rounded floral tubes and longer, obtuse floral bracts.